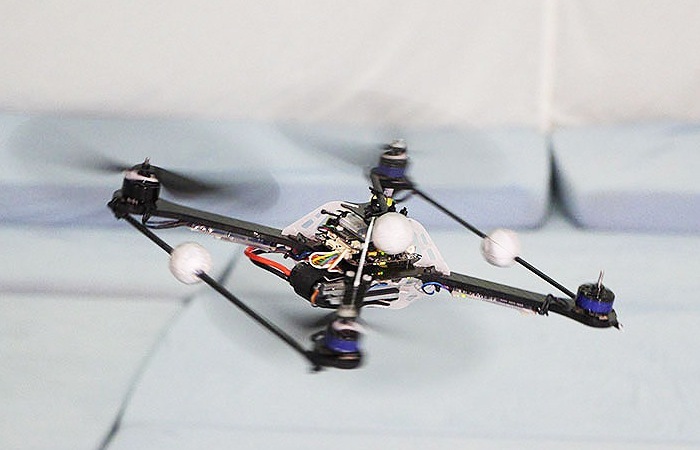 A new failsafe algorithm has been designed for quadrocopters that will now allow the vehicle to be able to recover from an engine failure and land without a problem. The video after the jump shows how a quadrocopter using the automatic failsafe algorithm is able to recover and gracefully cope with the loss of a propeller whilst in flight. Using the new quadrocopter automatic failsafe algorithm the failure is detected automatically by the system and it responds accordingly to correct the loss of the fourth propeller and finally executes a controlled, soft landing, on the user’s command. “The failsafe controller uses only hardware that is readily available on a standard quadrocopter, and could thus be implemented as an algorithmic-only upgrade to existing systems. Until now, the only way a multicopter could survive the loss of a propeller (or motor), is by having redundancy (e.g. hexacopters, octocopters). For more information on the new automatic failsafe algorithm for quadrocopters jump over to the Robohub website for details.